Everyone has heard of Meltdown, and Spectre vulnerabilities in modern computers leak passwords and sensitive data. In case you don’t, the most important thing to remember is to update all devices that mainly have an Intel processor, including mobile devices. 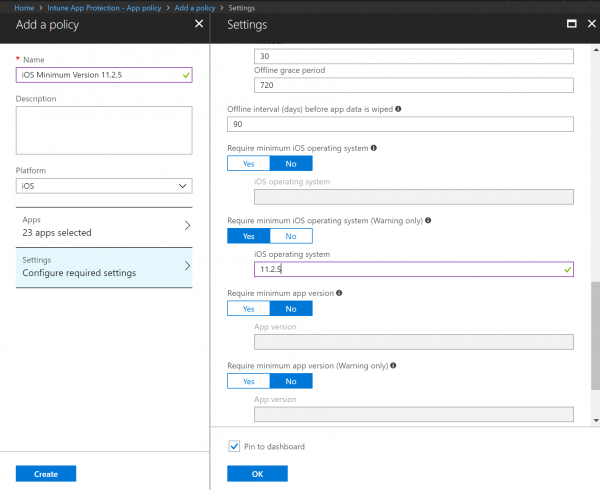 If you are using Microsoft Intune to manage mobile devices in your organization, you can configure compliant rules to force the users to update their operating system version. For those who want to keep their old OS version, will lose their access to Office 365 at one point. It’s essential that employees know the importance of updating their devices more often, without being enforced. On the other hand, updating OS means some types of the device won’t be supported anymore. In case your company accepts BYOD, some users will require purchasing a new mobile device. 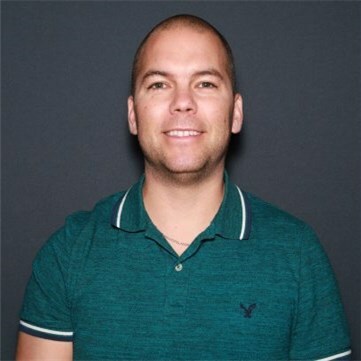 In the end, securing your endpoints is more important. In this post, we will use the Meltdown and Specter vulnerabilities with iOS platform. The iOS version that resolves Meltdown and Specter vulnerabilities are 11.2.5, to further protect against Spectre exploits. Take note that this guide can be useful for future breach, other supported platforms, and the new versions as well. 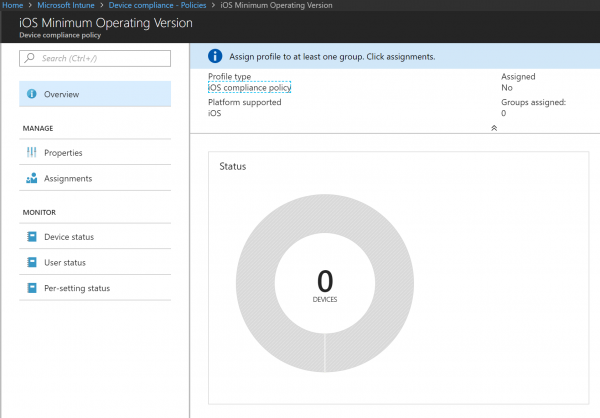 There are two ways to enforce a minimum iOS version, the first is enabling a warning message on each connectivity to an app, and giving the users a grace period to update their devices or, the second, quite simply blocking access to Office 365 right away. 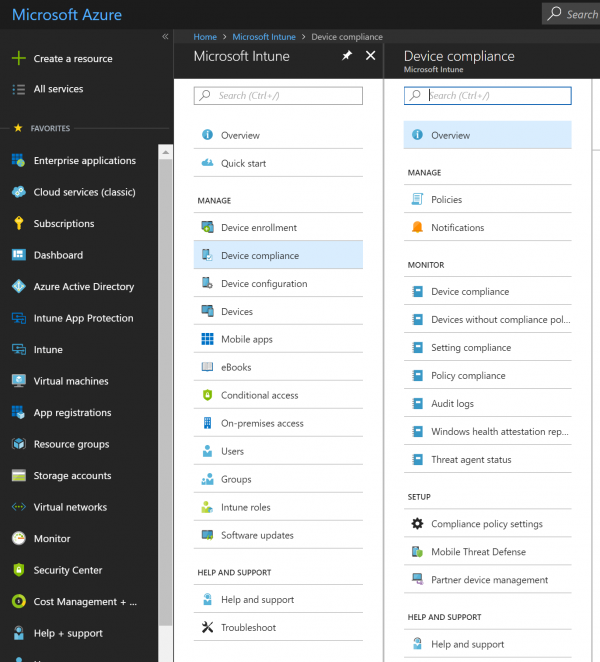 Using Intune App Protection allows IT to send a warning message to the devices and keeping access to company data. 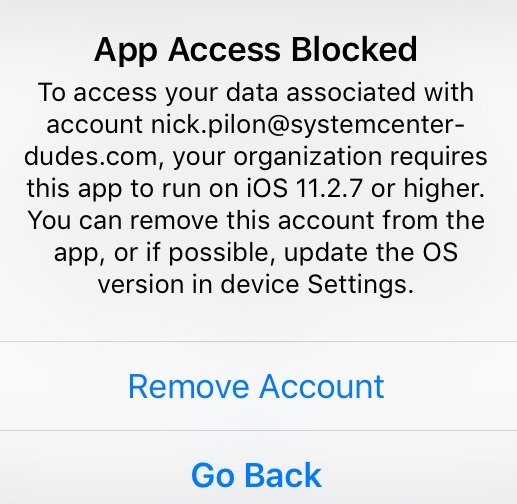 This popup will appear each time the users will connect to a company app, like Outlook. This technique slightly eases productivity and don’t affect user experience. 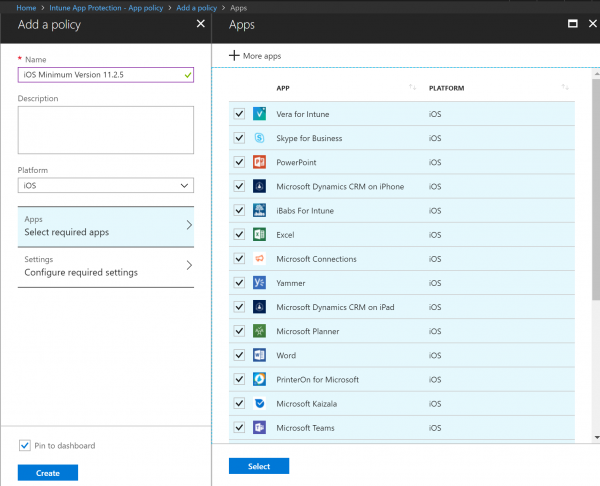 At this stage, it’s not mandatory to be enrolled in Intune. 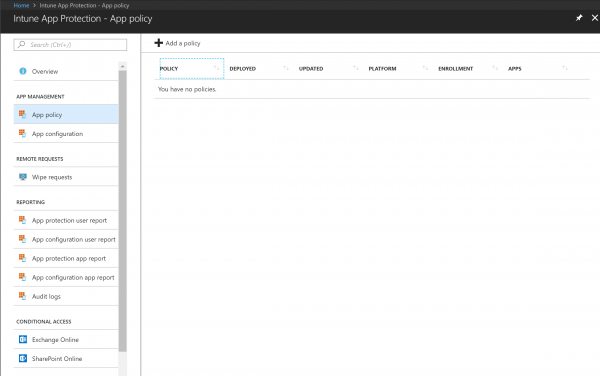 Click on Ok and select Pin to Dashboard if you want to see the statistics of this policy in your Azure Dashboard. 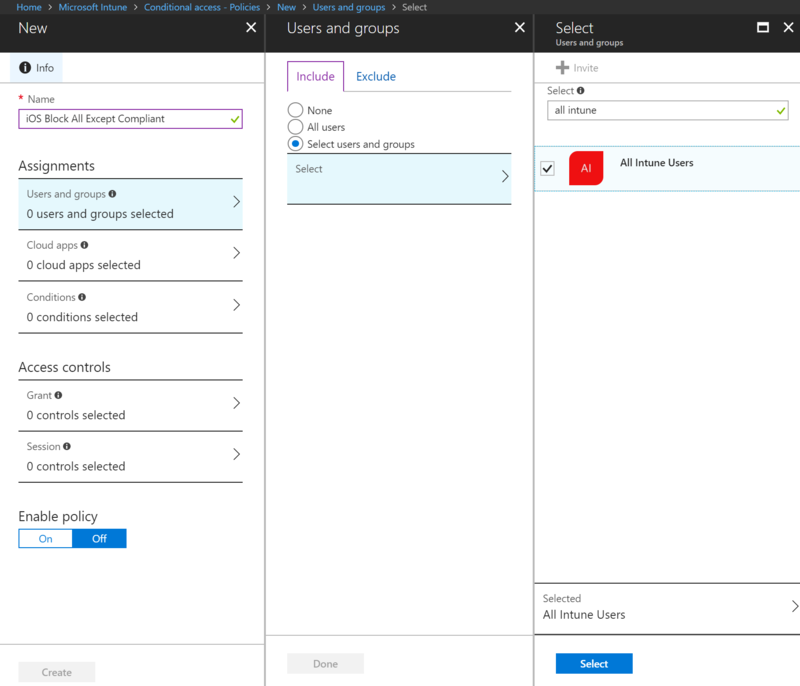 The policy is completed, it’s now the time to deploy the policy to an AAD group. Select the policy you just created. 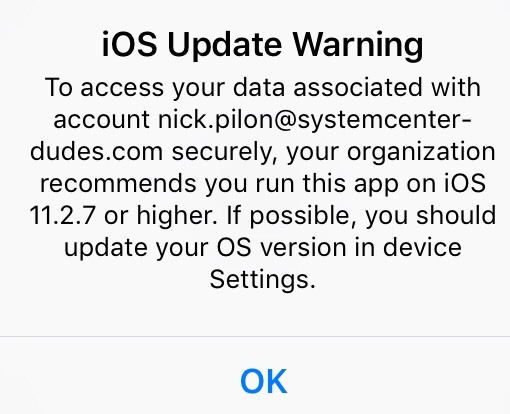 Under those circumstances, expect the users to get this kind of warning message if they are not compliant. It won’t affect access, and the user can continue working by clicking Ok. The good thing about sending a message to user’s device is they are not losing productivity and can manage to upgrade their devices during off-hours with personal wifi. The sad thing is the breach still there. What you can do is giving few days (3-7) grace period, and once it’s over, kill the switch. 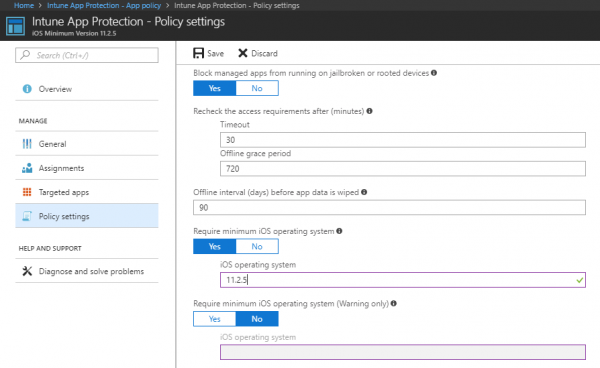 In order to block access to mainly Office 365 app, you can still use Intune App Protection. 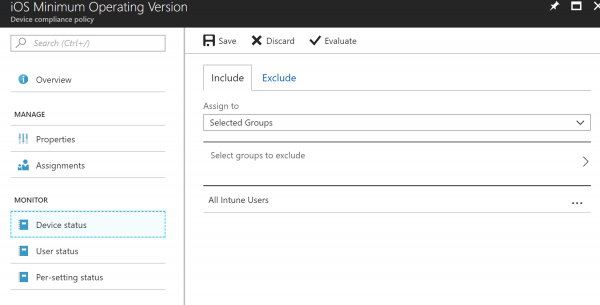 At this stage, it’s not mandatory to be enrolled in Intune. 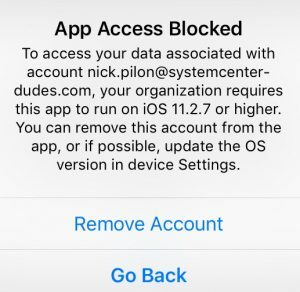 Now, if the user still has not updated their mobile device, their access will be blocked and this message will be displayed. There are only 2 options, Remove Account or Go Back. Unfortunately, the next step is to protect access to your company’s data by using Conditional Access. Business data is precious nowadays, and breaches are expensive for businesses. That’s the reason why it’s essential to make sure your mobile devices comply with security policies. With Microsoft Intune, you can configure a device compliance policy that enforces a required minimum operating system version. 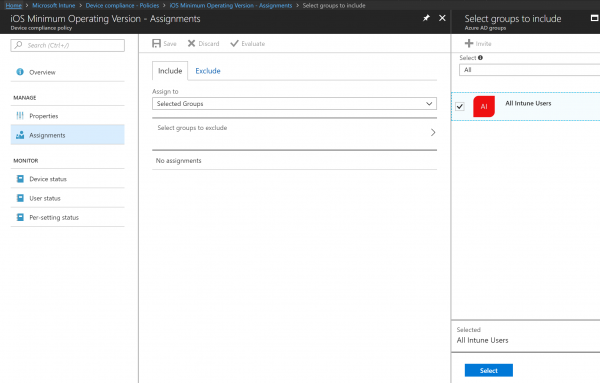 Assign that policy to users by using AAD groups. Overall, using conditional access is more efficient than only Intune App Protection. 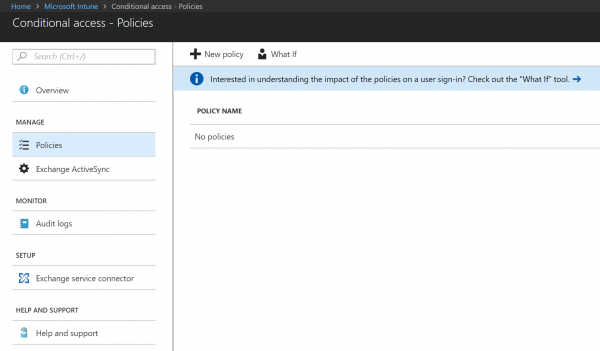 Once the policy is created, click Assignments blade to deploy the policy to users. 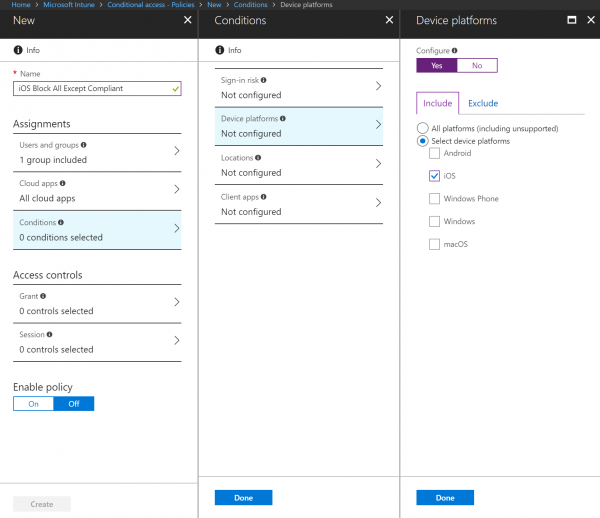 The configuration of the device compliance policy is completed and assigned to users. 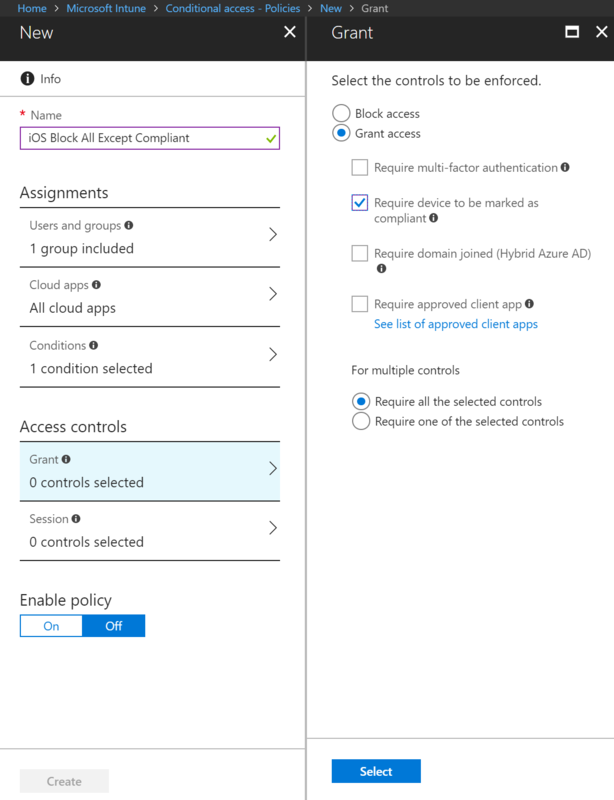 We are now ready to configure the conditional access to make sure all users that will try to access company data from not compliant devices, will be blocked. 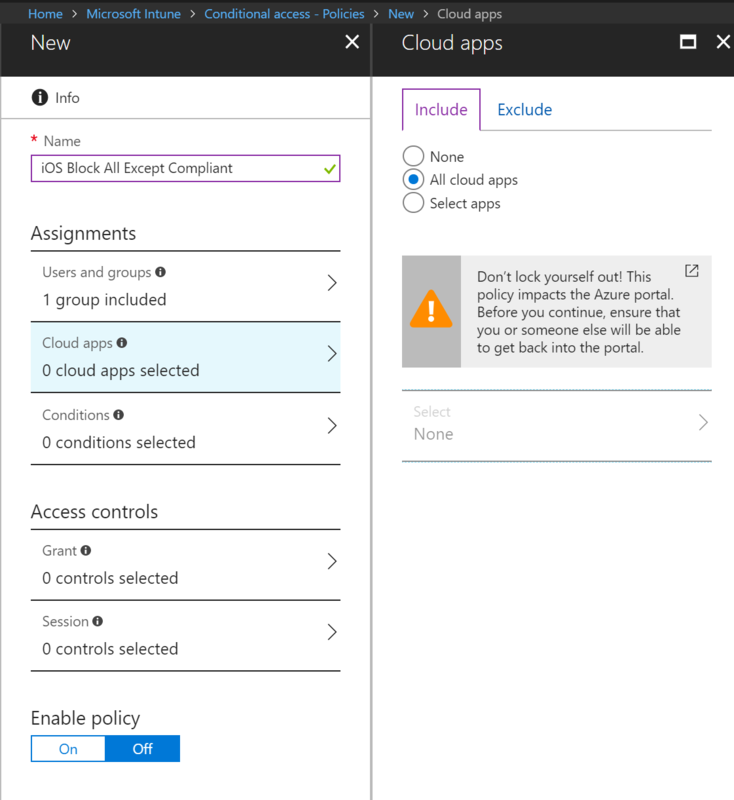 Now that the conditional access rule and device compliance is configured, once the users start to authenticate to some applications from their mobile devices, they will start to receive this kind of message. If your mobile device is not enrolled in Intune, you will get this message. 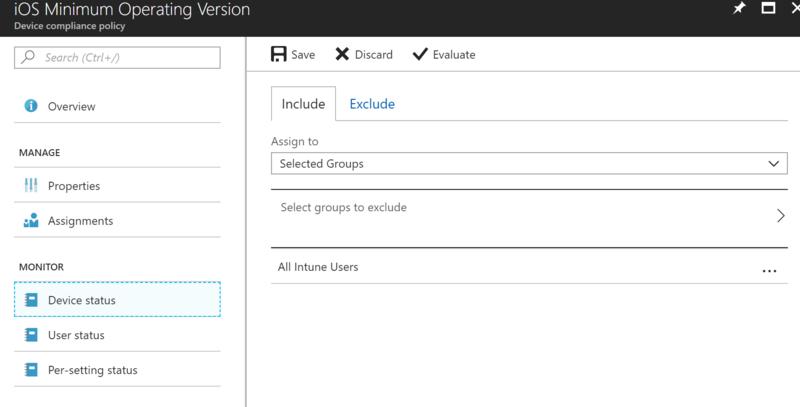 Click on Enroll and follow the step to enroll the device in Intune. If your mobile device is enrolled in Intune but not compliant, you will get this message. A good way to see why your device is not compliant is to open the Company Portal app and do a compliance check. 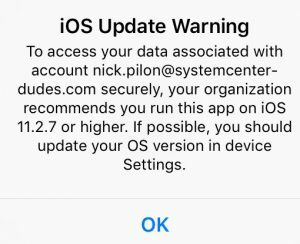 At this point, the only option you have is updating your operating system before thinking of connecting to the company apps. 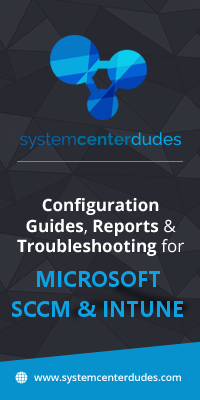 If you want to monitor Spectre and Meltdown vulnerability on workstations using SCCM, you can take a look at this post.